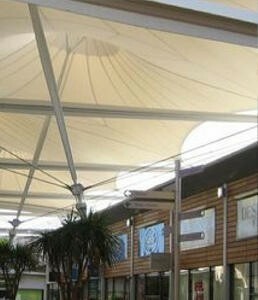 In one of Middleborough’s most popular shopping destinations, Napper Architects have designed a series of large conical fabric canopies to maximise space, light and air circulation while maintaining an enclosed and exclusive feel to the mall. The site of Dalton Park Shopping Mall is in every way a visionary scheme. Contractors Ballast transformed a disused colliery site into a striking landscape offering not only shopping and leisure pursuits but also wildlife and conservation areas. The tensile PVC fabric canopies are the signature element of this striking site. Covering more than 3,000 m2 of arcades, the conical fabric structures act as giant translucent umbrellas that allow light and air in, keep the worst of the rain out and illuminate at night to great visual effect. Completely tensioned from the perimeter, the fabric roof design allows column-free circulation space and avoids feelings of claustrophobia. Most importantly, the translucency and delicacy of the fabric structures retain the blur between the shopping centre inside and the wildlife environment outside.